“Santa” left me a great surprise on the seat of my chair in the office where I work this year. It was a neatly wrapped package with a Kindle Touch inside! As I read the note attached and carefully unwrapped the present, I felt like a kid again. 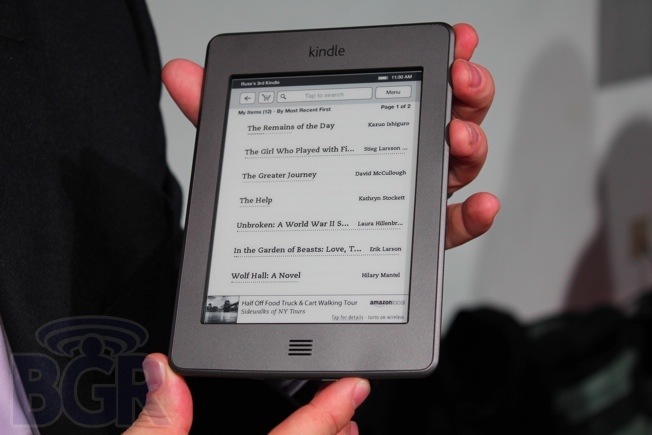 A KINDLE TOUCH????? What a great new toy for Christmas! It is something I never really considered owning, but now that I have one, I am loving it! As soon as I got home with my treasure, I began to experiment with it and downloaded some of the free classic books available on Amazon. My favorite feature is the built-in dictionary. How cool is that? I think it is marvelous! What a kind heart my coworker has to have given me such a thoughtful, useful gift. I hope “Santa” brought similar treasures to my loyal readers this year! Drop me a line and let me know which of your presents surprised you this year! Ho ho ho….. Merry Christmas! This entry was posted in Uncategorized and tagged Amazon, Books, Kindle Touch, reading. Bookmark the permalink. I received a Nook. Which I was not sure I wanted – but now that I have it I am really excited about it. Anything that will make me read more is a happy gift. I hope you enjoy the Kindle. I appreciate your feedback and hope you will find future reviews interesting to read. Though I don’t always succeed, I strive to read and share books which I believe, are a cut above the rest. It might be just me, but i think as though this post is really meaningful, i would surely mention it to my friends so they would also read it. I’ll be back to check of other posts.